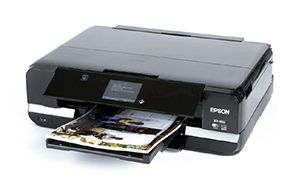 The Epson Expression Photo XP-950 is an A4 printer that also prints photos on A3 media. It is small (479x356x148mm), and features include an 88mm LCD touchscreen; automatic Wi-Fi set-up and Wi-Fi direct connectivity; a memory card reader that reads SD, Memory Stick and CompactFlash; a 4800dpi flatbed scanner, and PictBridge, USB and Ethernet connectivity. The printer uses six Claria Photo HD dye ink cartridges (cyan, magenta, yellow and black (CMYK), plus light cyan and light magenta). The XP-950 is easy to set up and performed faultlessly throughout our test. Photo print quality is exceptionally good, mainly due to the use of six inks. 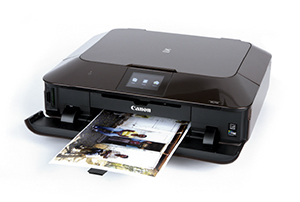 The XP-950 will satisfy both the casual user and the dedicated photographer who wants to produce high-quality prints. 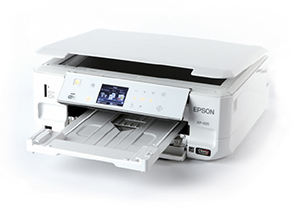 The Epson Expression Premium XP-605 is a compact printer (390x341x138mm) that includes a 63mm LCD screen with touch-panel navigation buttons; dual front-loading media trays for A4 and photo media; a scanner with 1200x2400dpi resolution; and a memory card reader supporting SD and Memory Stick cards. Connectivity is via USB, PictBridge and Wi-Fi. Epson Connect allows you to print wirelessly from smartphones and tablets, or by emailing the printer’s unique email address. This printer uses five ink cartridges (cyan, magenta, yellow, photo black and a black for text printing). the media trays are perhaps a bit fiddly, they nevertheless handle the media faultlessly. The compact (445x608x390mm) HP Envy 4500 has minimal features, including a small mono LCD screen for menu navigation. The 4500 uses a USB port, but does not have PictBridge or a memory card reader. However, it does offer Wi-Fi. The scanner has a 1200dpi resolution, while media from A4 to 150x100mm can be used, and there are two cartridges – a cyan, magenta and yellow tri-colour, and black. Photographic quality is fine for the occasional user. The colour swatches on our test print are excellent, while other photographic elements are vibrant. The blacks are rendered as a dark grey, although this does produce good shadow detail. Black & white prints are neutral with no visible colour cast, albeit with weak blacks. For those on a tight budget, the HP Envy 4500 may fit the bill. The HP Envy 120 measures 429x336x110mm and has a 109mm LCD screen that swivels up to a 45° angle when the unit is on. Features include Wi-Fi and USB connectivity, and a memory card slot for SD, Memory Stick and USB drives. The printer uses two ink cartridges, a tri-colour (cyan, magenta and yellow) and black. The motorised media tray has a capacity of 80 A4 sheets. There are plenty of ePrint apps available for the user to download and print, such as lined paper and greetings cards. 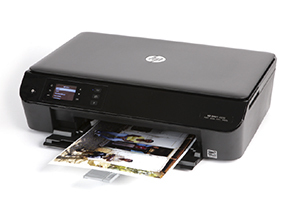 Print quality is similar to that of the HP Envy 4500, with vibrant colours that lack a dynamic punch in the blacks. Our test print had a slight overall red cast, which was noticeable in black & white prints. The scanner has a resolution of 1200x2400dpi, and when scanning a thick book the lid does not sit squarely on the document surface, causing blurred areas on the scan. While the functionality of the entry-level Pixma MG3550 may be limited, Canon has not scrimped on photo quality. The compact MG3550 measures 449x304x152mm and offers Wi-Fi print for connection to smartphones, tablets and computers, USB connection to a PC, and a scanner with a resolution of 1200x2400dpi. Two ink cartridges are used: a tri-colour and black. The front-loading media tray takes up to 100 sheets of 80gsm A4 plain paper. Print quality is surprisingly good for an entry-level printer. Colour images print with vibrant colours, and while a portrait had a bit too much red, it was still pleasing. Black & white prints have a good range of cast-free greys through to a solid black. The printer lacksa memory card reader and LCD screen, but reproduces photos with good definition. 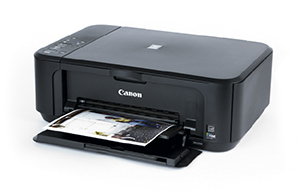 The Canon Pixma MG7150 has six ink tanks, for pigment black (for text), black, cyan, magenta, yellow and grey. Features include Wi-Fi printing; a memory card reader that supports SD, Memory Stick and CompactFlash cards; an 88mm TFT touchscreen; USB 2.0 and Ethernet ports; a 2400x4800dpi scanner; and an illuminated touch panel for printer functions. Despite measuring 466x369x148mm, the MG7150 feels compact. There are two media trays, with one cassette holding up to 125 sheets of A4 plain paper and the other holding up to 20 sheets of photo media, and a direct disc print tray. Print quality from the MG7150 is excellent, producing vivid colours that are not oversaturated. Reds are a very strong colour, while the black & white element on our test chart displayed clean, neutral, grey tones.